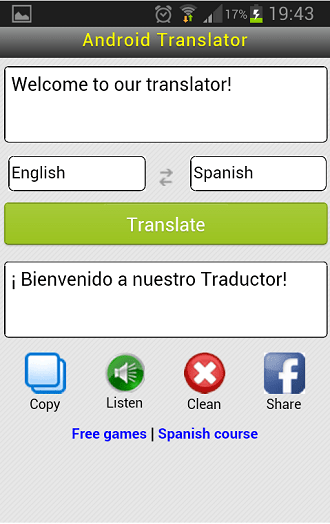 Free Translate Android App Review: Flawless Translation in 40 Languages! While some developers are trying to entertain you with their exciting games, or making profession specific, there are some people working just to make your life simpler with smartphone. This time I am going to review one really great language translation app, named Free Translate! So as I said, this app converts any of your text from one language to another. The interface is pretty straightforward to use, as all you have to enter of paste the text you receive in some other language, and just one click will get your answer, exactly in the language you selected in language options. As of now this app has managed to work perfectly on 40 languages, that you can use to translate in just few minutes. Note that this app requires an internet connection to operate, without which, it can not retrieve the translated content from its server. A simple copy function helps you take the translated text from your ‘Free Translation’ app, to your texts or emails. You can even do the reverse, and copy things from your other smartphone services to this app. You can also listen to the translated words/sentences by using a quick button available on output screen. So now you copy it, share it, listen or clean it up! (en) English, (es) Spanish, (pt) Portuguese, (de) German, (hu) Hungarian, (ar) Arabic, (id) Indonesian, (bg) Bulgarian, (ca) Catalan, (it) Italian, (cs) Czech, (ja) Japanese, (zh-CHS) Chinese (simp), (lv) Latvian, (zh-CHT) Chinese (trad), (lt) Lithuanian, (ko) Korean, (ms) Malay, (ht) Haitian, (no) Norwegian, (da) Danish, (fa) Persian, (sk) Slovak, (pl) Polish, (sl) Slovenian, (ro) Romanian, (et) Estonian, (ru) Russian, (fi) Finnish, (sv) Swedish, (fr) French, (th) Thai, (el) Greek, (tr) Turkish, (he) Hebrew, (uk) Ukrainian, (hi) Hindi, (ur) Urdu, (mww) Hmong Daw, (vi) Vietnamese, (nl) Dutch. The app runs flawlessly on any Android device we have tested, on even a low-speed data connection. The translations were mostly accurate all the time, and most importantly they were translating faster. So if you compare this with, going out in a browser, find translator on web, and do the same thing, this app will take only the one tenth time to do the same thing on your Android Smartphone or Tablet. Overall, I will highly recommend this app to everyone who uses Android devices, and especially for those who love to play or learn translations in different languages, or need to use it professionally. Also, being a free app, makes it a totally worth trying at least once! Legend Online: Dragons Android Game Review - Much Needed RPG Action!